The continuing cold and blustery weather is keeping a few members at home although balmy weather is expected next week. Meanwhile Roger Day in his brand new Supernova won the first race of the day to continue to dominate Series 1. A similar story in Series 2 with Kevin Milton winning today’s race to lead the series overall. 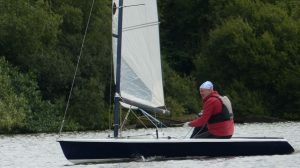 The Comet fleet continues to grow with Paul Jago now joining this fleet and is quickly getting to grips with his new boat.